When I started making this recipe, I wanted to make a traditional spicy eggplant dish that you find in Indian restaurants. As I was about to start cooking, I realized that I did not have tomatoes since I had used that to make a spicy split pea lentil recipe that turned out really tasty. Then I realized I was missing another key ingredient, Paneer (Indian Cheese). At this point I was too lazy to go out to the store to pick those items. I had to think fast as to what I was going to make for the blog and dinner. My daughter was starting to get impatient and she shouts “Dad, I am hungry! Is the food ready yet”. Ah, the pressure between trying to come up with a recipe when I do not have all the ingredients and a hungry little girl. Think, Think, Think. How could I improvise a eggplant dish for which I did not have all the ingredients? But before I could improvise the dish, I needed to feed my wife and a really hungry and irritable daughter so that I can think in peace. I made some Basmati rice and served it with spicy split pea lentil. Eating rice with the lentil was enough to satisfy everyone. Now back to improvising my dish…..
Now I had to figure out how I was going to improvise a recipe that not only will taste good but is also worthy of posting it on the blog. Plus, the photos had to look appetizing! Aha, got it. I just needed grated coconut. I frantically searched the pantry for it but could not find it. I knew I had it somewhere. At this point I was really starting to get irritated and opened the freezer to cool myself down with some ice cream. Lo and behold! What do I find? A pack of frozen grated coconut. The next item I needed was a container of Spanish peanuts that I found in the pantry. 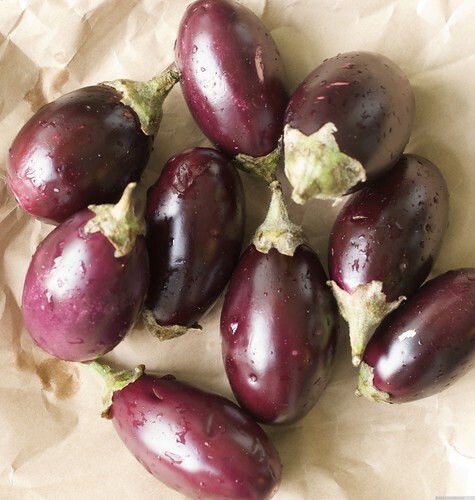 By now I had all the ingredients I needed to make a tasty dish with baby eggplants! Eggplant with French bread tasted really good. 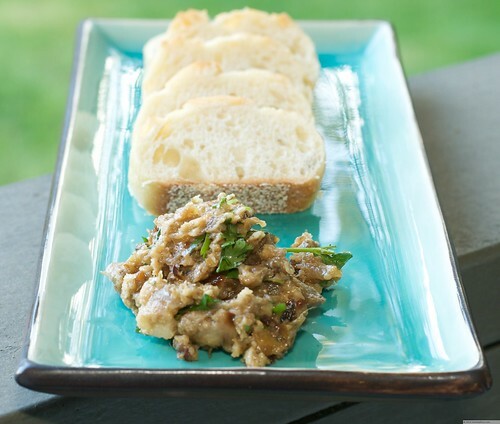 Top a crusty french bread with the eggplant pate. 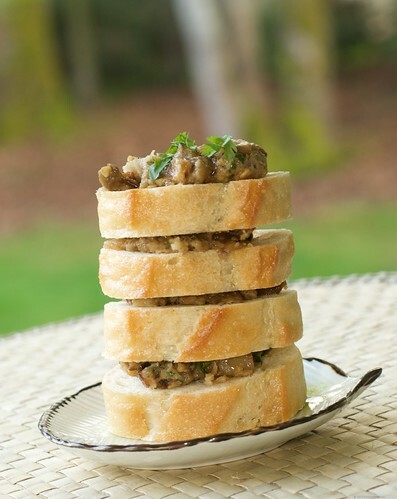 If you added the green chilis for a spicy pate, then eat with Naan instead of French bread. Heat oven to 375 degree Fahrenheit. 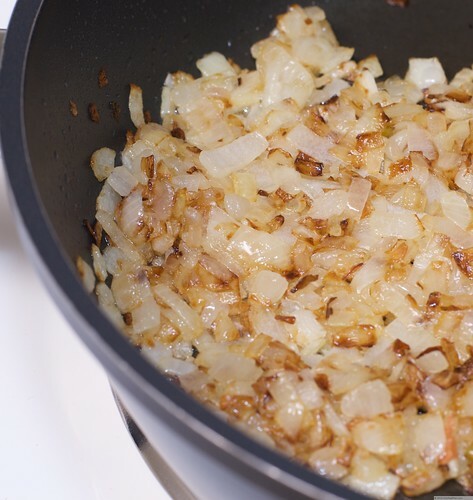 On medium heat, add oil and onions to a medium pan and cook onions till they are carmelized (light brown), approximately 10 minutes or so. Add ginger and fry for a minute. Add red chili powder, coriander powder and add chopped eggplant and cook for approximately 10 minutes. Oil a baking dish and add the cooked eggplant mixture. Cover with aluminium foil and bake for 20 minutes. If you prefer a spicy dish to eat with Naan, add the green chili before baking. Take the baking dish out of the oven. Grind the peanuts in a coffee grinder (I use a coffee grinder exclusively for grinding spices). 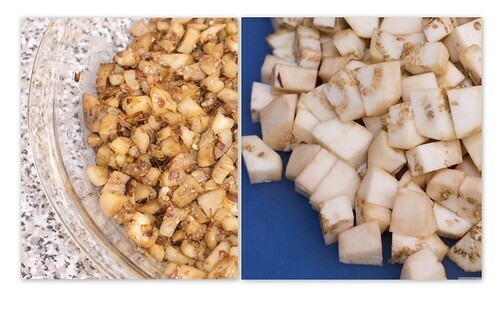 Add the ground peanuts and grated coconut to the baked eggplant and mix well.